Which Big 12 teams play the best out of conference schedules? With the college football season less than a month away, I want to take a look at how teams will be challenging themselves this coming season. That means grading the part of the season they control–the nonconference schedule. After starting with the ACC (Atlantic and Coastal), I’ll continue with the Big 12. Baylor opening with an FCS team? Color me shocked. This road trip to UTSA could actually be a tough game for Baylor, as the two programs have been spiraling in opposite directions the past few years. Baylor will want revenge for a home loss last year. I actually really like this home-and-home between Baylor and Duke. Both programs were on the rise when the games were scheduled, and both have fallen off since them. This should be a good game. Grading Baylor is a bit tough. The Bears were expected to be a CFP contender when they were making this schedule, but the program has collapsed since then. Still, this schedule has one cupcake, one semi-cupcake, and one good game. That’s not bad for 2018 Baylor. Scheduling tough FCS teams is always a risk, especially for a program with Iowa State’s recent history. This rivalry is one of the most underrated P5 annual games. This year, both teams might actually end up being ranked, to boot. It’s a good time for the Hawkeye State. The Zips are a perennial cupcake, but Terry Bowden has done an incredible job with the program. This game might be competitive for a quarter or two. Iowa State is usually a team that needs all the wins it can get to make a bowl, but that doesn’t look true anymore. Two cupcakes and one tough game is expected for the Cyclones in a normal year, but maybe this is a little too easy for where Matt Campbell has the program. Even bowl eligibility is a pipe dream for Kansas. Honestly, the Jayhawks should have scheduled three FCS teams just for a chance at wins. A road game against a MAC school that has a tendency to beat P5 schools in recent years. I have no idea what Kansas was thinking here. I don’t even think we’ll get an enjoyable game out of this. I usually say that my favorite thing in college football is when two equivalent P5 teams schedule each other. So Big 12 doormat against Big Ten doormat should be great, right? Except, of course, for the fact that Kansas is still so much worse than Rutgers. I appreciate the effort, though. I mean, I have no expectations from Kansas, so it’s hard to give a real judgment on this. I guess we might get at least two somewhat competitive games out of this, so… yay? This is actually a somewhat scary game, as games against FCS teams go. I love this series. It’s a mid-to-upper Big 12 team against a mid-to-upper SEC team. I wish more teams in both of these conferences did this. The clear rivalry potential is already there. UTSA is trending upwards. This was probably expected to be a total cupcake when the game was scheduled, but it does have some serious trap game potential here. For a team that has the potential to be anywhere from barely a bowl team to a New Years’ Six contender, this schedule is solid. It’s got one great game, plus two cupcake games that have that tiny bit of uncertainty potential. This game was meant to be an easy season-opener when it was scheduled, back in 2015. Now, it looks like a heavyweight opening the season against a potential top team from outside the P5. We all remember what happened the last two times Oklahoma did that, right? I think Sooners fans still get angry at the name Max Hall, and they certainly remember Greg Ward. I have no idea where the UCLA program is at right now, but Chip Kelly is going to want to make an early statement, and this will be a great chance. All of a sudden, for the first time in half a century, Army looks competitive as well. 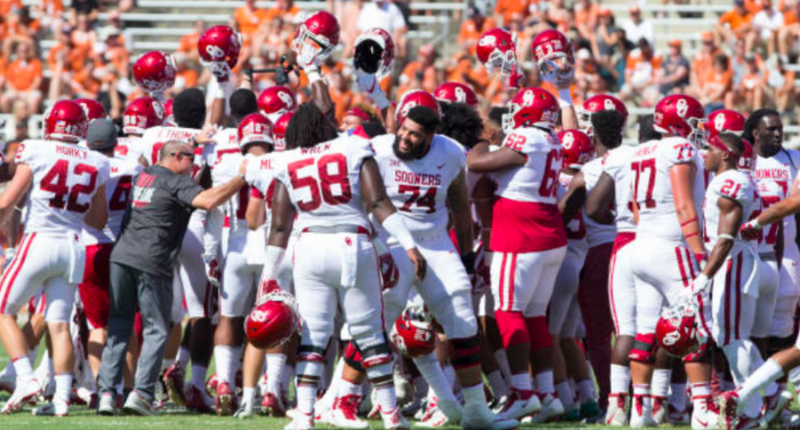 Oklahoma won’t have a week to rest before the bye, except for maybe against Baylor. Oklahoma only has two easy wins (Baylor and Kansas) on this entire schedule. By season’s end, this may very well be the toughest schedule in all of college football. If Oklahoma is in competition for a CFP spot, it would be hard to imagine that this schedule doesn’t push them through. The Cowboys open with a mediocre FCS team. Yawn. The Jaguars were a poor Sun Belt team and lost to Oklahoma State by a score of 44-7. This makes cupcake #2. You won’t see me complain about a lack of P5 team on this schedule. Playing Boise State honestly takes more guts than playing most P5 teams. This should be a great game. The game against Boise State is great, but there are still two total cupcakes on this schedule. That’s weak. And the Boise State of this half of the decade is solid, but it’s not the same as the program was 5-10 years ago. Opening with an FCS team seems to be an unfortunate trend in this conference. This rivalry is not currently an even one, but SMU has been improving somewhat recently. Still, this isn’t the toughest of games. TCU is always a fringe CFP/NY6 contender. Playing Ohio State is always a great way to give yourself a chance to make a statement on that front. The opening two games don’t really move the needle much, but when you only have three nonconference games and use one of those against Ohio State, all is forgiven. Tom Herman’s opening season got off to a rocky start with a loss to Maryland. The Longhorns get a chance at revenge, but this time on the road. Tulsa had one of its worst years in recent memory last year, but that wasn’t due to being a bad team. A lot of it as bad luck. Don’t let the 2-10 record fool you. This team is no cupcake. A nonconference game between two blue bloods? Always, please. Texas might struggle to make a bowl again this year, or if Tom Herman can engineer a Year 2 turnaround, the Longhorns might be challenging for a New Years’ Six bowl. The schedule certainly gives them a chance, if they can live up to it. If they don’t, the schedule also sets up to miss a bowl. And, honestly, that’s the kind of schedule I love. This game would have been incredibly tantalizing a few years ago. It probably has far less importance now, but still looks like a ton of fun. The Cougars might not be quite the same team that won the Peach Bowl or beat Oklahoma and Louisville earlier this decade, but they do still have Ed Oliver. it’s great to see a Power 5 team schedule them. There’s an FCS team on this schedule, but there are also two games that should be great for college football fans. No complaints here. This should be an amazing opener. I love it when two equivalent P5 teams play each other out of conference. Gotta love a Bo Pelini trip back to the Big 12. This is another game between mid-to-top P5 teams. Both are dark horses in their own conferences, and both are certainly solid programs. Well done. West Virginia is another one of those teams that always seems to have the potential to go anywhere from 5-7 to 10-2. This schedule makes it no different this year. There are no guaranteed wins here, and two games that should be excellent. I had thought that I wouldn’t give a perfect grade to any team that schedules an FCS school, but I’ll make an exception here. There are two games away from home against equivalent P5 programs, and the FCS game is against a top FCS program to boot.